Kim Buttram The Director of The Forney Economic Development Corporation, J Stephen Sadler Owner of Crumbzz and Darren Rozell The Mayor of Forney, at the Texas Presidents Awards Gala. 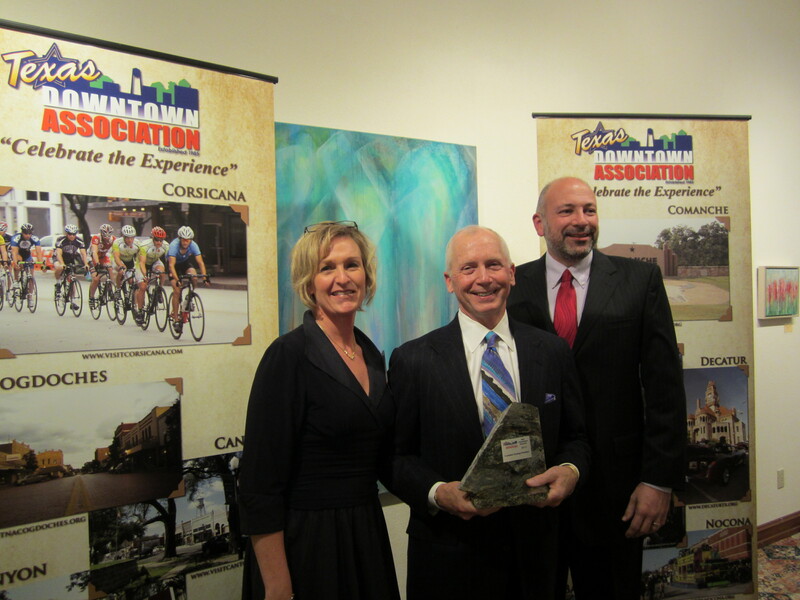 Since 1998 the TDA has recognized over 150 projects, events and people that make a difference in Texas downtowns. The best Downtown Business award recognizes an exceptional downtown business that positively promotes the downtown or commercial district as a destination for locals and tourists alike, and actively participates in the revitalization efforts and supports downtown promotional events. Winners were announced on November 8 at the Presidents Awards Gala held in conjunction with the 2012 Texas Downtown Development and Revitalization Conference in Wichita Falls. The event featured awards for; The Best Commercial Interior, The Best Renovation / Rehabilitation, The Best Restoration, The Best New Construction, The Best Public Improvement, The Best Marketing Program, The Best Promotional Event, The Best Downtown Partner and the most coveted The Best Downtown Business Award. Judging for the awards took place on Thursday, September 6, in Austin. The distinguished jury panel included the following representatives: Martin Bevins, Texas Co-op Power Magazine; Diana Blank, Kyle Economic Development Corporation; Melissa Burnett, Downtown Alliance San Antonio; Julie Fitch, Downtown Austin Alliance; and Kevin Walker, Community Revitalization Strategies. The Texas Downtown Association, established in 1985, is a statewide nonprofit organization comprised of almost 400 members involved in downtown revitalization projects. By fostering development and revitalization, TDA strives to enhance the economic vitality of Texas downtowns and neighborhood commercial districts by providing resources, networking opportunities, education and advocacy. Crumbzz was presented with the award because of how the company, the City of Forney and the non-profit Forney Art Council (FAC) overcame the many challenges they faced as they joined together to create a truly unique experience in a small Texas Historic Downtown. By having an established base of worldwide clientele, joining with the City of Forney to build a world-class european bistro and partnering with the FAC to house the Forney Gallery of Arts, Crumbzz instantly created a destination business for visitors and locals alike. An accomplishment that often takes years to accomplish. The City of Forney now has the cornerstone in their effort to revitalize Historic Downtown Forney and make it THE destination for Texans AND out-of-state visitors. Kim Buttram The Director of The Forney Economic Development Corporation, J Stephen Sadler Owner of Crumbzz and Darren Rozell The Mayor of Forney, with the Best Downtown Business In Texas Award. The Texas Downtown Association recognizes an exceptional downtown business that positively promotes the downtown or commercial district as a destination for locals and tourists alike, and actively participates in the revitalization efforts and supports downtown promotional events. Crumbzz involvement in the presenting local artisans works, working with local farmers and ranchers for it’s produce, introducing local small town residents to a traditional big city fine dining international bistro offerings and the nationwide attention it generates through the distribution of it’s crumb cakes and subsequent draw of out of state visitors to the community, were all factors in the selection of Crumbzz as the 2012 Best Downtown Business In Texas award presented by The Texas Downtown Association.